Recently we grew a lime caterpillar into a beautiful butterfly too. Link up your post to my blog. Hope this is ok. Certainly we have no problem with you placing a link to our blog article. Fantastic blog, love your videos! Great documentation and the write-up is very informative!! It is nice to know young kids these days have teachers like you who give them a head start in nature watching and strive to make preschool days as joyful as possible for them. Great work! Selena. 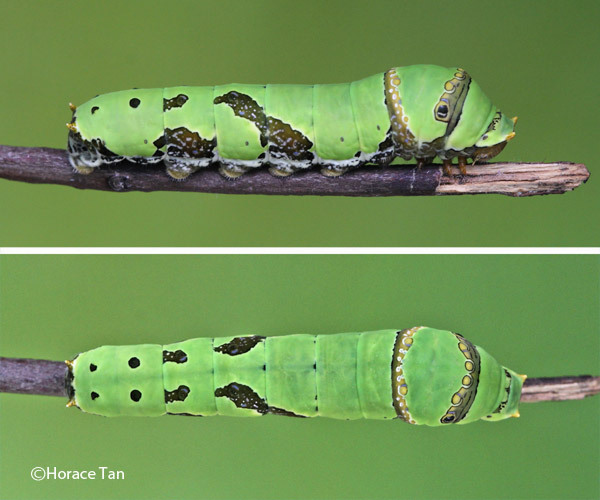 can i ask?why some journal said the color of third, fourth and fifth instar is green color? 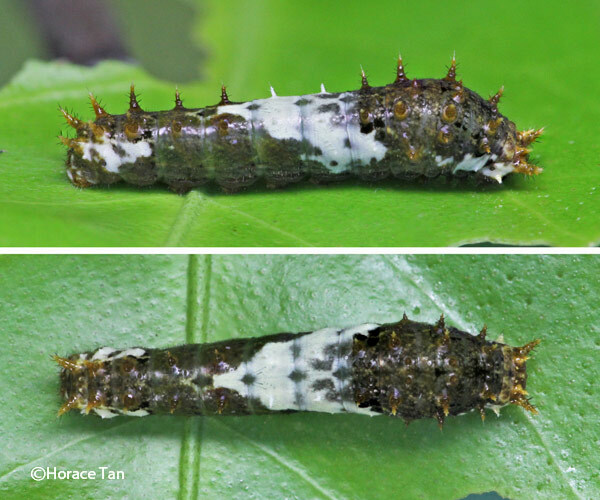 Hi Akmar, could you quote the referenced journal article which stated the said coloration of the larvae in 3rd, 4th and 5th instar? It would be interesting to note and compare the sample sets in terms of geographical distribution and other environmental factors which might play a part. 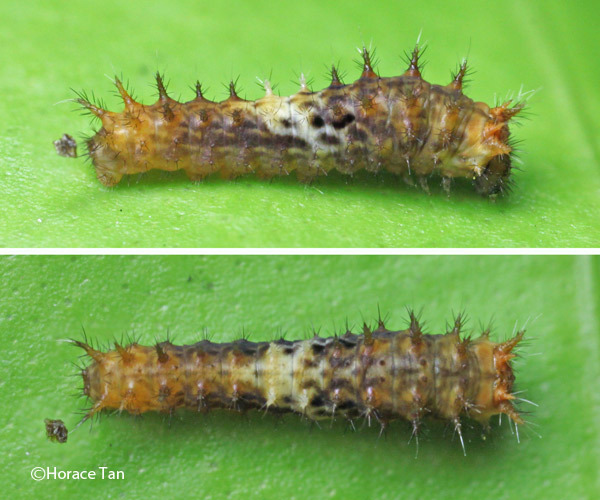 It seems to me that the author at that site mis-labelled the figure with the three final instar larvae at those of 3rd, 4th and 5th instar larvae. there is a lime butterfly pupa on my door!i saw it wiggling after shaking off its head... expect a Butterfree in 9 days! I found a pupa in BC Canada. interesting read. It would be interesting to see the adult emerging from that pupa. Hi I am in need of a quick Butterfly lifesaving information. I had three puppa's on my lime plant. 1 did not manage to come out of it puppa and died while trying. And the other one is now drying of his wings but the wings seem to be the wrong way around (the bottom bit is on top instead of tucked underneath. First we noticed that only with one wing and we tucked it bak under but now it keeps popping back onto the top, and the other one has now also oppped to the top. Is that normal? And how long before they fly away? It has been drying on the plant now for almost the whole day and is not able to fly. I am not too sure of what is happening to your newly eclosed Lime butterfly. 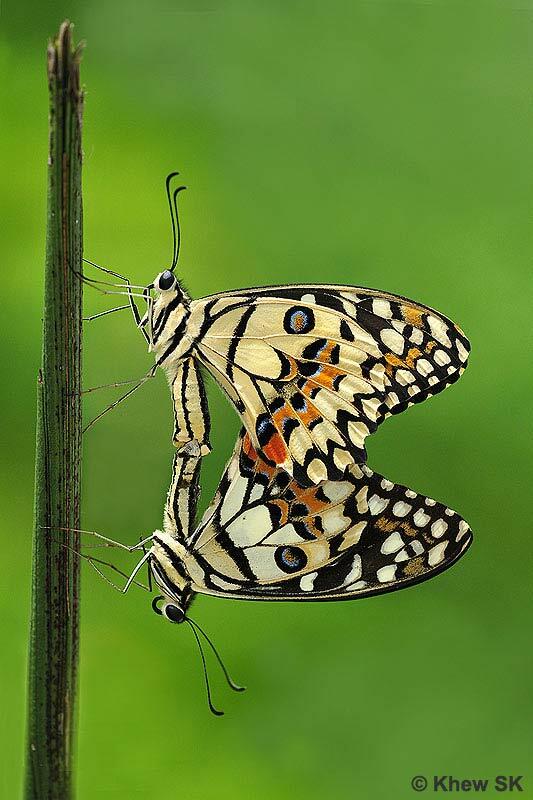 Normally the butterfly will take flight after a few hours of resting on or near the pupal case. Could you take a pic of the butterfly to show us what is wrong with the wings? hi guys,my lime caterpillar run out if lime leave where could i find leave in singapore ? 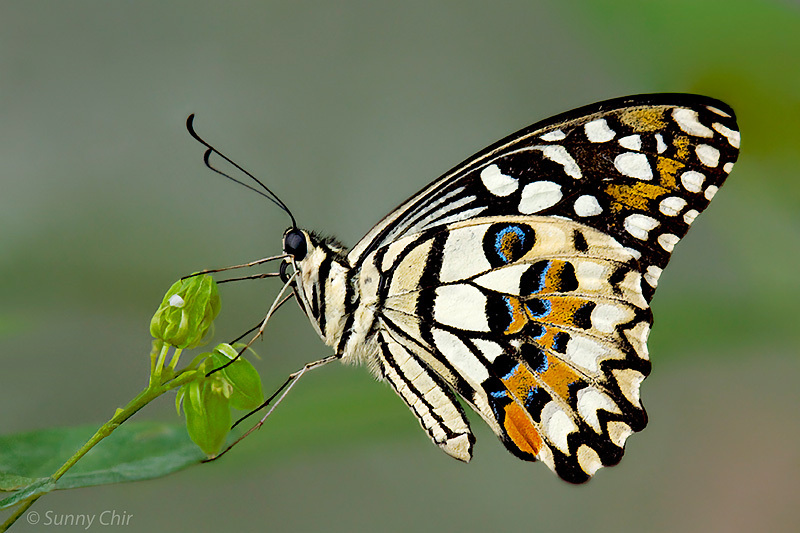 How can we keep a hatched butterfly after it hatches before letting it go? The caterpillar I passed to a friend has hatched but thinking of keeping it till her mom comes home. Is it a good idea? Many households have lime plants cultivated along the corridor outside their units, you could try asking your neighbours who happen to own the plant. Otherwise, you could try purchasing the lime leaves solid in packet form from NTUC Fairprice or stalls at the wet markets. Usually we release the newly eclosed butterfly as soon as it takes flight. Otherwise, keeping it in the container for longer period of time would risk damaging its wings, especially for super-active butterflies. 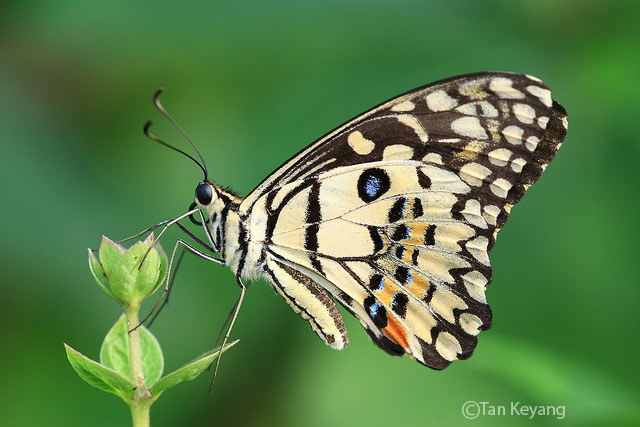 To calm the butterfly, you could place it in a dark surrounding. Do not buy the lime leaves from the wet market. My 3 caterpillars died after they ate the lime leaves from the market. I saw ants crawling out of a tiny hole in the pupa this morning. Does that mean it is dead for sure? Ant? These could be some tiny parasitic wasp sp. instead. A hole on the pupa and exit of other organisms are definitely proof that the pupa is parasited. The Lime specimen is dead for sure. Thank you so much for the information. Your site is great by the way, I have learned so much from it. I must say I am a little bummed by this. It was the first caterpillar I have even seen turned into a pupa. Was looking forward to see it fly! Oh and it was definitely common-looking ants although I noticed that one of them was a little bigger than the rest. They had no wings. How long did it take for the emergence of those ants, counting from the day the pupa was formed? Hi Horace, I had initially found the fresh pupa on the ground near my rue plant, already swarmed by ants. I realised it was fresh as its previous skin was laying near it in the midst of some gooey liquid. I "saved" the pupa (only recognising it as a pupa after looking at your website) and glued it onto a chopstick. It was still wiggling at this point. I then left it on my bookshelf for about three days. On the fourth day, I thought it might be better to place it near a plant, such that it might get more moisture, so I brought it out and stuck the chopstick into the soil of my plant pot. It was evening that day when I found a hole on the pupa and ants began to crawl out upon further inspection. It's a long story but hopefully you get the picture! It does seems that the pupa was attacked by the ants, and not parasited by wasps/flies. it's been 4 days since my caterpillar(lime) pupated, but it still hasn't turned brown. it's the same shade of green as it was in the beginning. is there something wrong with it?? I need help! The pupatory larva was found on the soil. When probe it did wiggle a little so I stuck it on a double side tape and tape it to a stick. Will it still survive? Oh dear, for a proper pupation to take place, the pre-pupatory larva should be in a girdled position. Try to secure it by the posterior end and hope for the best (that the pupa will be properly formed). Hi, I brought in 11 caterpillars from my lime tree. Due to limited supply of lime leave I decided to purchase lime leaves from supermarket. The next day caterpillars that fed on the bought lime leave died. Why they died after being fed on the bought lime leaves and not leaves from my lime tree? Really sad seeing them gone and not knowing the reason. Please help. Thks. 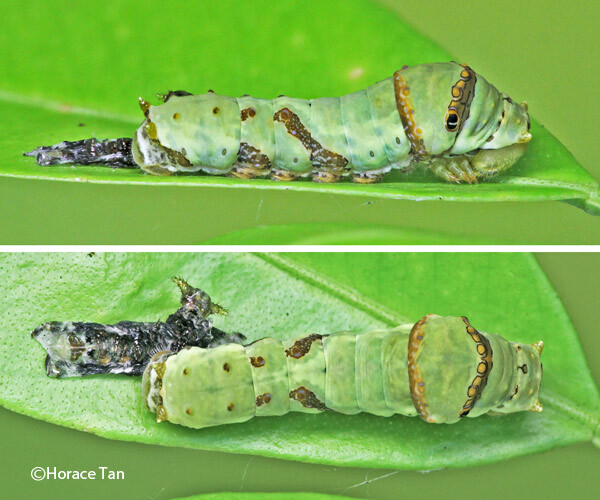 Poh Peng Goh, it may well be that the lime leaves from the supermarket have been laced with pesticides to keep them from being eaten by pests such as caterpillars in the first place. If you did not wash them, or if there is even a small trace of the 'poison' on the leaves, the caterpillars would be killed. Thkd commander, yes, i was worried of any traces of pesticide on the lime leaves so i washed them thoroughly leaf by leaf. However they still died. I tried to ask some from my neighbour and still the caterpillars were not spared. Only by eating my lime leaves or lemon leaves did they successfully live on. I have tried feeding them on supermarket and neighbour one before and they were fine with it. I really dont know what really happen this time? A different species? Due to my limited resources, i need fresh and non toxic apply of lime leaves. I found an egg on a line plant in my daughter's school garden & we brought it home hoping to see a caterpillar emerge. However, it has been 3 days and the egg still hasn't turned brownish. We have left it indoors by the window, and it is still on the leaf on which we found it. Does it need the warmth from the sun to incubate? May I have some advice please? Thanks for your post, Dot. 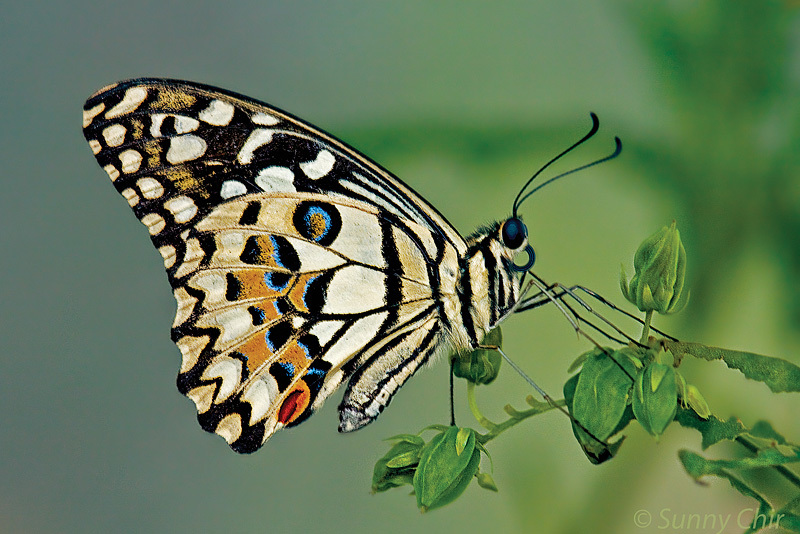 In many instances, eggs that a female butterfly lays may not be fertilised and will not hatch. In other cases, the eggs may be parasited. There are a lot of reasons why the eggs may not hatch. If it's after 5 days, chances are the eggs are not viable and are likely dead. Thanks Commander! We'll wait for another 2 days & hope for the best then! Hi again, I eventually found a caterpillar 1 week ago, and he is in his 5th instar, and in a few days he will pupate. Just wondering if I should remove the leaves so that he'll pupate on a sturdy stem? You know it is time for pupation when the caterpillar stops feeding and wandering about with body length shortened. Should it pupates on a leaf and the leaf falls off, you can always proceed tosecure the leaf to a stick or a surface. 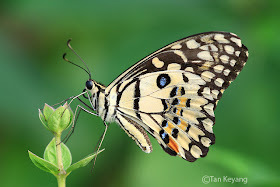 This blog is an excellent source on sharing about butterfly. I also encounter similar problem. Finds that they grow better on the plant than in captivity. Stopping between feed is normal, but stopping for a long period could mean the caterpillar is going to moult to the next phrase or that is is "sick" for some reasons (virus or parasitoid). For such cases, you just have to monitor closely. Hi again, I took in 9 eggs from my plant, and although they all hatched within an hour of each other exactly 1 week ago, a couple have already moulted to the 4th instar today, while the others are still happily in their 3rd instar. Is this accelerated growth rate normal? And should I expect them to pupate more quickly? Could they also eclose earlier than the 9-10 days as documented? It is normal that siblings do not grow at the same rate. The faster will reach adulthood earlier. This has an advantage of decreasing the possibility of inbreeding. The length of the pupal period also depends a lot of environmental factors such as prevailing temperature. 9-10 day period is just a reference for a tropical setting. Ah I see, how interesting. Thanks Horace! This blog has been the main source of information for my little group of friends and I who have begun looking after Lime Caterpillars. Although each of our caterpillars looks slightly different, especially their markings in the 5th instar, they're all absolutely beautiful & a delightful pet especially for our young children. So, thank you again! I have a new question though. My caterpillar just pupated on a leaf on a stem which I cut from a plant. Do I have to snip the leaf stem off and secure it on a vertical stick? I'm asking because I'm not sure if the leaf will hold up when it dries up, even though I noticed many silk threads around where the leaf joins the stem. I think this was the caterpillar's effort to secure the leaf. For the leaf attachment to the stem, you could try to reinforce it with a good-sized lump of blue-tack encasing the attachment. In the end, I used a few drops of UHU glue at strategic spots to secure the leaf and it worked! Because my fat fingers couldn't attach the blue-tack without touching the chrysalis. The leaf would've fallen for sure otherwise. So it managed to hold up for 10 days, and we released the beautiful butterfly yesterday morning. Thanks, Horace! - how long do lime butterflies live? 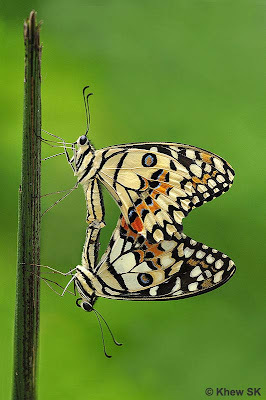 - how long does it take for mating to be complete? 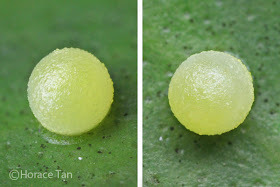 - how many eggs would a female lime butterfly lay? - what if a chrysalis forms partially lying down, or hanging completely from the bottom only (without the side girdles)? I have not done the necessary research to answer your first three questions on the Lime Butterfly. 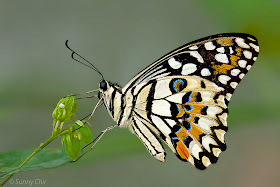 If you google around, you might find some general answers applicable to most butterflies (You could take a look at this site: http://www.butterflyfarm.co.cr/en/educational-resources/the-scientific-realm/frequently-asked-questions-and-answers.html). 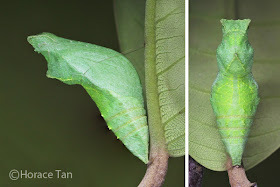 If a chrysalis comes into contact with a surface (like the bottom of a container) during the formation stage, and its features distorted as a result, then there is a chance that the emerging butterfly would suffer from birth defects on its wings or palpi, antennae etc. 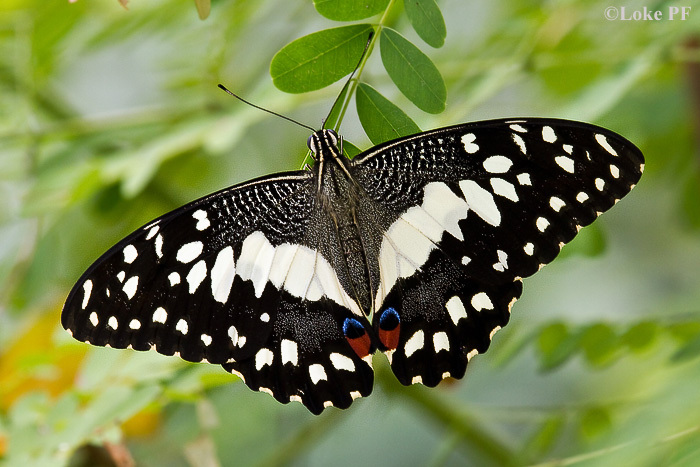 If the girdle breaks, the butterfly might not emerge properly or might have ill-formed wings. Thanks so much Horace! Hoping for the best for my friends' two soon-to-be butterflies then. My lime caterpillar fell off the stick it originally girdled on and is only a pre-pupatory larva. It's now on the paper towel at the bottom of the tank that I kept it in for the past 10 - 13 days. It still wriggled a little bit but I'm concerned about how I ought to reattach it to suspend it in the ideal position. The previous caterpillar I had also fell but in its fully formed pupa stage. I had glued it the wrong way unknowingly (cephalic horns pointing downward) but it managed to emerge alright. I'm not sure about this one though. Pls advise... Thanks! 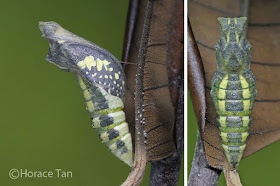 The pre-pupa needs to have its abdominal end attached to the silk pad and its upper body supported with the silk girdle, in order for the pupation process to proceed smoothly. See if you can re-attach the pre-pupa in this way. Otherwise, we could only pray hard that it somehow is able moult to the pupal form on the paper towel. 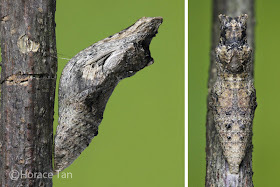 Usually a pupa formed not in the normal supported position tends to be 'out-of-shape' and the adult to emerge would likely to have wing defects too. Hi, i found a chrysalis on the lime plant n brought it home.. it has been 9 days n hv not eclosed. Is it dead? Where are you from? 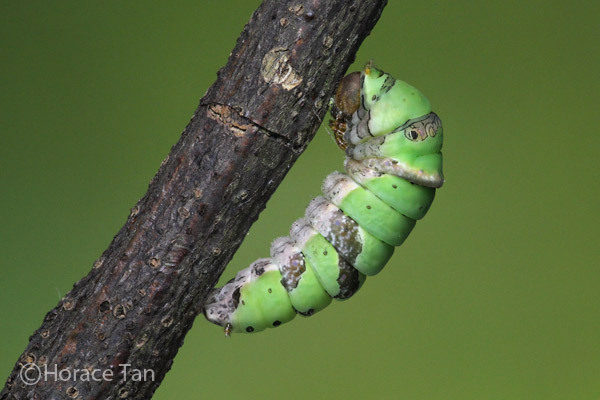 In temperate countries and in the colder months, pupation period is typically longer. Just keep for a few more days and monitor any change to it. 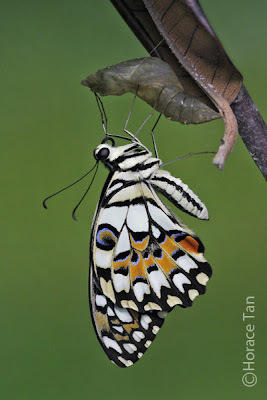 Keep your fingers crossed that what come out is a beautiful butterfly instead of some parasitoid larvae. Hi im in singapore but i kept my chrysalis in my room which is air conditioned at night n out of the sun in the day. Should i bring it out where it is nt air conditioned? I'd totally freak out if it was sth else n not a butterfly. Lol. 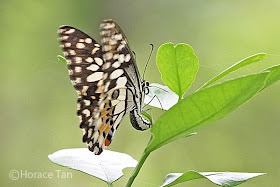 Thank you very much for sharing your knowledge about the lovely Lime butterfly. We've really appreciated watching ours grow. But lately, I am terribly guilt-ridden and distressed because ever since I bought a new kaffir lime plant, our poor caterpillars have all met the same fate: they are fine to feed from it at first, until we find them writhing about with their little horns, as if in agony, and in not much time at all they fall off the plant, and die curled up in a greenish pool of their own fluids. We've tried washing the leaves, isolating it from the cats and waiting for potential pesticides to dissipate, and still after a month or so it seems that a couple day's worth of eating its leaves proves to be fatal. What on earth is going on? I'm so disheartened that I'm almost ready to throw the lime plants out altogether. :( Please offer me your experience and advice. Having an air-conditioned environment will somewhat slow down the development within the pupa. You could try to move it to a place (out of direct sunlight) with normal room temperature. There are occasions where the pupa might just decide to "hibernate" for an extended period of time even in our tropical setting. It is hard to know for sure what is wrong with your lime plant or caterpillars, short of doing a chemical analysis of what was present on the plant. The easiest way to solve the problem is to use another lime species or from another source, or better sill grow the lime plant from seed. I had a similar encounter as you. Initially i thought it was due to the pesticide residue left on the leaves after washing. However after observing the leave pattern on my own lime leaves and the one i bought from supermarkets, i realised that the pattern was different. Those from supermarket have dots on the back of the leaves whereas mine is smooth on the back. As horace's advice, you may want to change another lime leaves to try. Recently i bought a pkt and it has no dots on the back and i tried it out with one of my 'catty'and it survived and now all of them is indulging it. Thanks a lot horace! I will try moving the pupa to normal temp n see if it works. 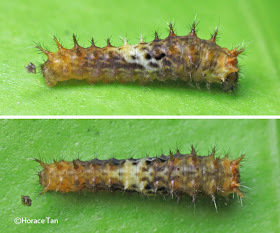 Hi horace, why are some 5th instar caterpillars bigger n some smaller? Is it because of different species or gender? Just like any other animal species, the growth rate and maximum height/length achievable of a caterpillar could vary from one individual to another individual even within the same species. Reasons such as gender, genetic disposition, competition or other environmental factors could contribute to the variations in the size of fully grown larvae. I happened to disturb the caterpillar when it was adopting its pupation stage and its currently not moving. Is there sufficient knowledge to know if doing so would have killed the larvae? Only time will tell whether the larva is not going to make it. Has the caterpillar "hooked" itself up with a silk girdle? If so, then it should be alright. Otherwise, wait a few days to see if it proceeds to do so. hi, i am rearing a lime caterpillar that my teacher passed to me. however, the leaves that it seems to be feeding on looks different from the lime plant that i have at my house. when those leaves have been finished by the caterpillar (millie), can i proceed to feed them the leaves from my plant? 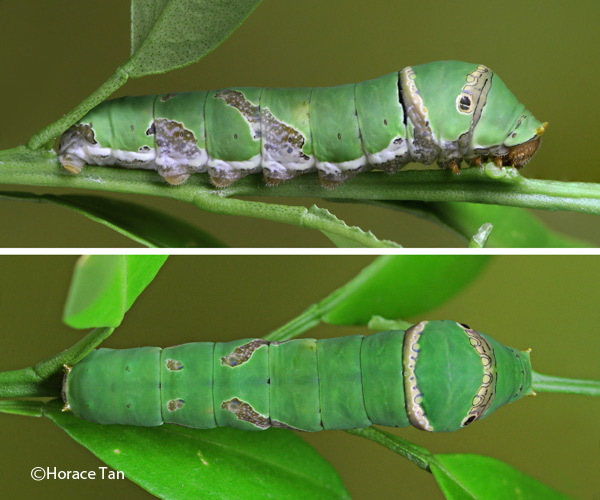 Hi Zogers, lime caterpillars can feed on leaves of a number of citrus species. If the lime plant at your house is the common citrus species (Citrus aurantifolia) cultivated by many households, then your caterpillar (millie) should have no problem taking to it. However, do check whether anyone has sprayed any pesticide on that plant previously. Pesticides can be deadly to caterpillars. 1. does over handling harm the caterpillars? 2. how does someone tell the difference between the two genders--- and can they be told apart in the larvae (caterpillar) stage? 3. will the caterpillar be fine if put in an air-conditioned room for about 1-2 hours? 4. could we do anything to prevent the death of the caterpillars if we are rearing them? thank you sooo much and if there are any other things that i should note, please tell me about them :-) cheers! 1. Gentle handling would not harm the caterpillars. 2. For some species with translucent skin, it is possible to tell the sexes apart by looking for the presence of immature testes underneath the skin. Refer to the following e-How post for details: http://www.ehow.com/how_5911369_determine-caterpillar-male-female_.html . 3. Air-conditioned room is fine. A lower ambient temperature just translate slower growth. 4. Keeping a good flow of good quality leaves and regular cleaning of the enclosure/container are things you could do to help prevent premature death. Please help! 2 of our caterpillars is in its pre-pupatory larva stage, but both didn't do its silk properly for the ends of its body, and so currently its silk near their face is the only thing supporting it from falling. We have once encountered this before with our previous caterpillar which died as its face was stuck with the silk and wasn't able to turn into a chrysalis. I really don't want both caterpillars to die so please give ideas and help me asap. Glue to save my caterpillars. If the pre-pupa has already spun some silk threads at where the abdominal end should be, you could try to gently push the abdominal end against the pad of silk there. Attachment should be possible if silk is present there. Using glue (small amount) to secure abdominal end should be used as a last resort. 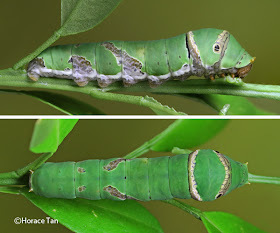 If pupation is able to complete this way without the pupa falling or the process aborted, then you could try to secure the cremaster in the same way (ie. with glue). One of my caterpillars just fell from its silk and so we are deciding to use glue or dental floss. We have laid it on a towel for the time being but as its late at night right now, im unable to get the glue. Will it be able to turn into a chrysalis if its laid on the towel overnight? The pupation might not proceed smoothly if the pre-pupa is not secured in the usual "hanging" posture. 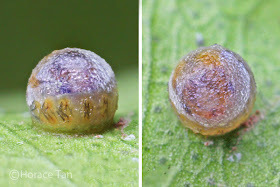 The pupa might be malformed with the larval skin not fully separated from the pupa, and the side of the pupa which comes into contact with the surface might be flattened. Hope yours is alright. 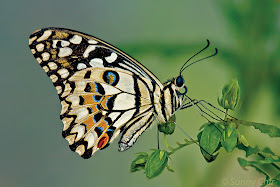 Hi Horace, thank you for the wonderful documentation of Lime butterfly. I found a caterpillar on my lime plant 3 weeks back. Search on butterflies that lay eggs on lime trees brought me to your blog. With the help of your detailed description I showed my young children how the caterpillar will become a butterfly. They both eagerly helped me gather leaves and feed the caterpillar. It got a bit boring once it pupated. But today morning a beautiful lady graced us .. We loved watching her dry her wings and finally crawl on to our hands to be set free. Thanks so much again. Thank you for sharing your and your children's breeding experience with the Lime butterfly in such a unique environment. :) Hopefully you get to encounter or even breed other butterflies there. Thank you for all these valuable and precious information. 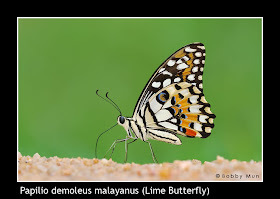 We have bred almost a dozen of butterflies from our lemon pot plant and still didn't have a clue on what kind of butterflies they are until I found your blog! 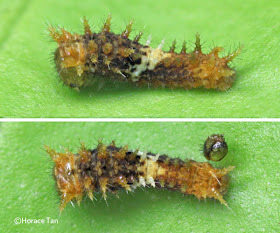 To share my experience : I only take the caterpillars out until its almost 3rd or 4th instar. Each individual caterpillar is kept in a plastic container with a piece paper at the bottom. We feed them with lime leaves bought from NTUC but we wash the leaves before we put into the box, worrying any pesticides left on the leaves. We clear the poop every now and then to keep its habitat clean. 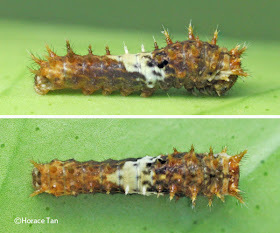 At it's 5th instar, a satay stick is put diagonally in the container to mimic the twig for pupation. My kids give the pupae to friends so that they can share the joy when the butterflies hatch out. Great blog! Thanks again ! It is heartening that your kids are sharing the joy with their friends. Thumbs-up. Hi! I love your blog, the information provided here is really valuable and interesting. (: I currently have a lime caterpillar myself, it is currently into the 5th instar stage, but it's curled up at the ceiling of the container, and I noticed that there's this yellowish stain/fluid at the spot he's resting above. It is quite a lot. I tried looking up online for what this could possibly mean, but found no valuable results ): Is this worrisome? Or is it a normal stage in their life cycle? The yellow fluid could have been exuded by the caterpillar when it was frightened by some events (such as a sudden brush/stroke to its body). Unless the fluid continues to ooz out even when it is at rest and not provoked (this would mean the caterpillar is ill), the one-off event of yellow fluid is not alarming. I released all eclosed adults of Lime Butterfly so I have no local data of the life expectancy of this species. If you google search for it, you will find that the Wikipedia page on this species mentions 4-6 days of the adult stage in Riyadh. Hi Horace, thanks for your blog, I find it very interesting and informative! I had one caterpillar just went into pupa stage 3 days ago. We kept it in an empty glass aquarium. yesterday its colour became a light brown. I am worried it could have died as we had 2 similar unfortunate cases where the caterpillar died during pupa stage. How do we know if the pupa is dead, or should we just wait and see? We live in Malaysia. Hi nileey, since the pupal period of about 10 days is not that long, you could wait it out. May be you could take a picture of the pupa, and post it here for us to judge whether the colour is the ``healthy'' colour of a good pupa. Really appreciate your advice and i hope it is still alive! The colour is paler brown than the usual greyish/dark brown. 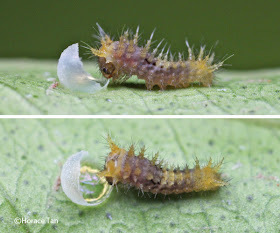 If the caterpillar was not bred from the egg stage and was taken from an outdoor plant, then the pupa could be parasited. Hopefully this is not the case, and a beautiful adult Lime Butterfly will emerge from it. It is great to learn that this Lime Butterfly managed to reach adulthood. Sad to learn that the butterfly was deformed. Haven't kept track of such statistics, but sugar and water should last the butterfly a few days. If you want, you can release it and let nature takes its course. Hi Horace, Faith here updating. The deformed butterfly could hardly unroll its tongue so i dun suppose it ate much. Anyway it died in 4.5 days. Hi Faith, Thanks for updating us of the fate of that poor butterfly. 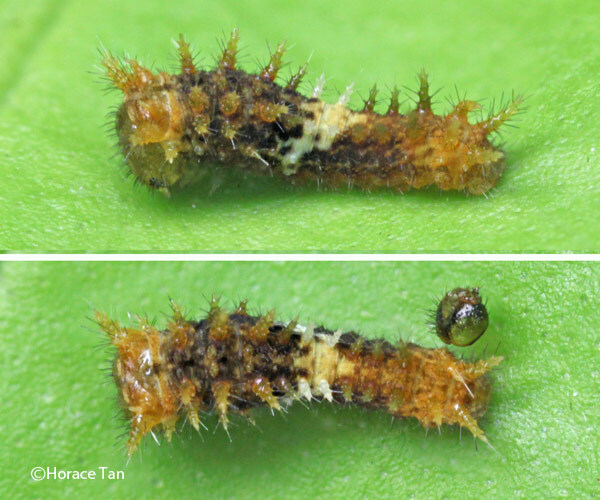 Hi Horace, I need SOS advice on how to remove sticky tape from the ProLegs of a Late 5th Instar Lime Caterpillar. The 3 prs of Thoracic (real) legs are not affected so it can still move about (slowly) & feed on the Lime Leaves in my plastic tub. It even managed to shimmy up Abt 12cm of a stick using only the Thoracic legs. i managed to remove only some bits of sticky tape by using some water to render sticky tape soft & less tacky. It is abt 4 days past its anticipated pupation day. Is it abe to pupate in this "stuck" state? Not sure about vege oil, but water usually works well with easing the sticky stuff from the sticky tape. If the amount involved is not excessive,the caterpillar should have no problem in turning into a pupa. There could be other reasons why the pupation is delayed. Hopefully, this particular caterpillar can reach adulthood. Thanks. It did turn into pupa on 30 Sep lying on its side with no silk girdle on the bottom of my plastic tub. The silk pad was weak & has dislodged. Pupal case is intact otherwise. Should i leave it as it is or try to attach the bottom of Pupa with some super glue on a stick so it can be in the normal position ? You can try to secure it by the posterior end to a stick, using some moderate amount of glue. Yes, done that with a bit of UHU on 2 Oct.
(3). 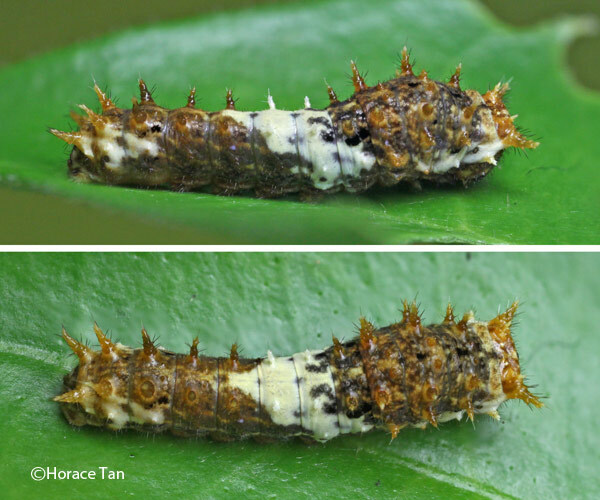 It is easiest for the pre-pupa to turn into pupa in that position? In relation to conservation of butterflies, would u think picking up Lime Caterpillars from their Host Lime Plants in our backyard gardens to rear them & then release them when they enclose will help? I can find about 10 Caterpillars ( various Instars ) on Ave a month. A friend of mine keeps urging me to take the caterpillars in to save them from regular NEA mozzie foggings & rain ( water kills the eggs & early Instars?) I already had 15 Pet caterpillars turn into butterflies in the past year. Friend prob has 3 x that # . What are the survival rates in Captivity indoors vs in the "wild" ( aka in home / urban gardens)? 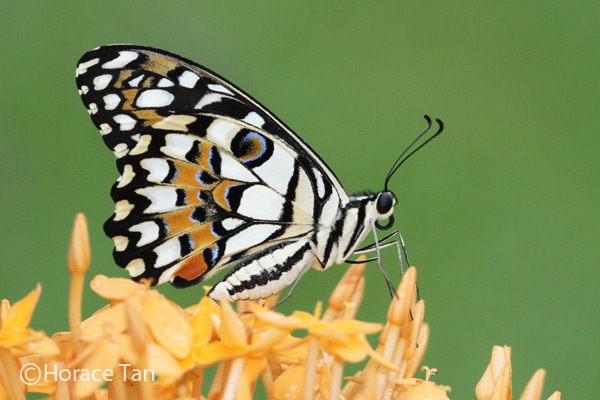 Also, Are SG butterfly spp. & #s monitored annually like Bird watchers do a Bird Census annually? I am inclined to think that the normal position for the pupa happens for a reason, and all that you suggested are parts of that reason. I am more of the opinion that caterpillars should be left alone to develop in the wild, being part of the ecosystem. Being a novice, I don't have any statistics like survival rates to share, sorry. I found a 5th instar in my potted plant. It went into pupa stage in a different position from your photos. In your photo above, the pointed end (not sure if this is posterior?) is below and attached to the stick, and the horned end is anobe and pointed upwards slanting at 45 deg. And your photo has the pupa in a almost vertical position. 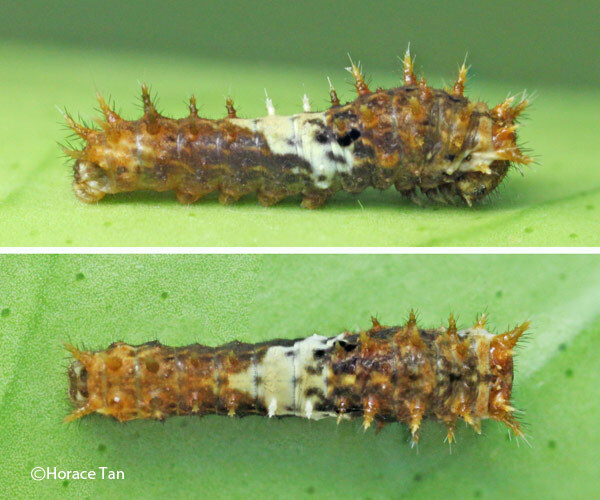 But the pupa at my plant has the pointed end attached to the bottom of a stick (so this side is actually above), while the horned end is pointed down at 45 deg. So the pupa is in a horizontal position with horned end pointed down at 45 deg. And develop into a butterfly and flew away without any defects. Have you encounter the pupa in a horizontal position before? Do keep us posted of the outcome of this specimen. I have been raising a few butterflies successfully but today, one of the pupa had a hole in it and many parasite wasps crawled out of it. This pupa was raised alongside with other caterpillars. Will there be a high possibility that others are infected too? I'm really worried right now and the small swarm of parasitic wasps don't seem to want to leave my house. Any idea how I can chase them away? Yes, there is a high probability that others in the same batch could be parasited as well. Hopefully this is not the case. Those wasps will not last long if they are trapped in the confined space. You can always spray some insecticide (away from the caterpillars) to get rid of them quickly. 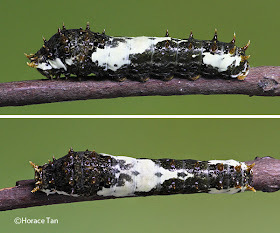 I just found caterpillars that look just like these on my curry tree but when i checked, it also looked like common mormon caterpillars. Is there any way to differentiate between them? Help urgent. My 2 5th instar caterpillars tat were about to pupa suddenly died n the box had like an explosion of tiny black dots. Is it parasited. I m so worried it will affect my other caterpillars reared in another box side by side or infect my house as I put it in living room. Please advice is it due to leave a I tool from garden outside. It have reared many before but never had this situation before. Pls advice urgently. Worried like mad. I mean the box was filled with nurmerous tiny black dots all over. But I didn't see the dots moving. It is hard to tell whether they were parasited, given that the "dots" weren't moving. Were they hatched from eggs? Anyway, since you are afraid of infection, you should discard the deceased caterpillars together with the container they were housed in. Thanks. Think it's vomited green dots cos of pesticide in the leaves it ate. Anyway wanted to thank you for your detailed blog that has been really great in helping me rear my lime n mormon butterflies. To date I have successfully reared 9 with 6 coming along the way. Latest batch came all at a go really busy trying find food for it too. Yup, sometimes I also find it challenging to source sufficient food for these early stages of butterflies. Where did you find all these caterpillars? Just visit your neighborhood estates, there you can find potted lime plants along corridors. 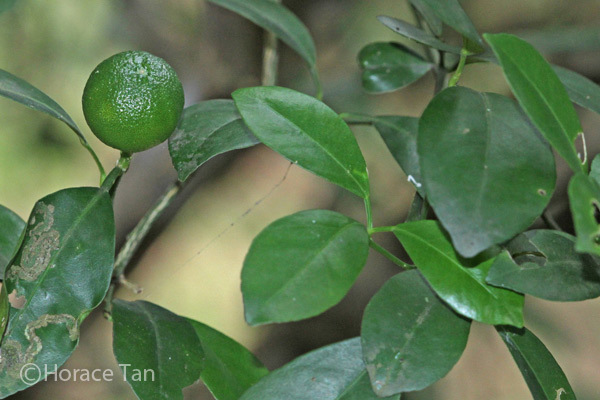 Lime plants are also cultivated in gardens and parks by NParks. Some schools have them in their butterfly gardens too. 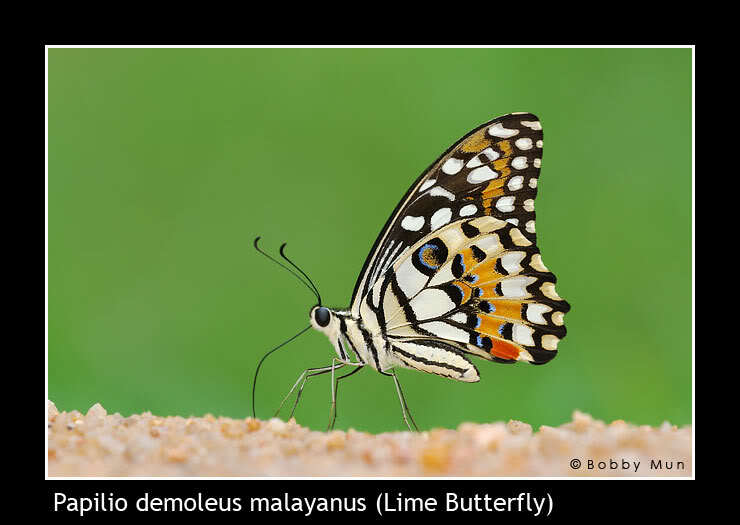 These are where you might be able to observe early stages of the Lime Butterfly. You can also buy them at farms such as Oh Farms at Bah Soon Pah road, or from stalls during festive fairs. 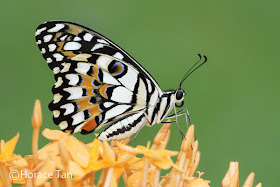 Hi, love your blog and articles about this butterfly. with this info i successfully nurtured and released 3 batches of butterlies so far. im currently on my fourth. 1) is the caterpillars' frass toxic? is it dirty? can they be used as fertilizer? also, the current batch of pupa do not hang as they usually do, like in a hammock. they are hanging like monach butterfly pupa or like bats. is this cause for concern? all of them are doing it. 1. 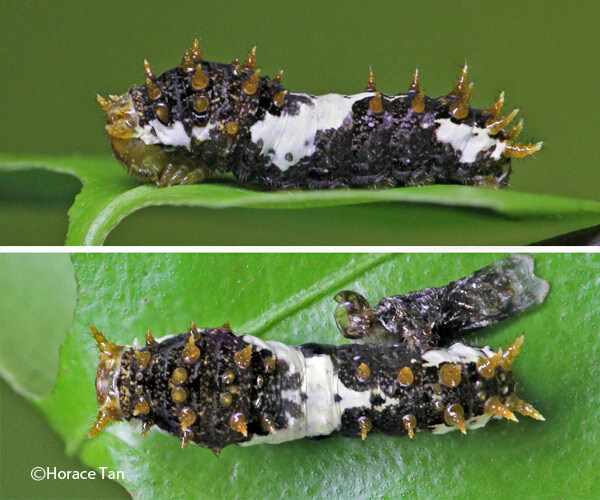 Caterpillars' frass originate from the plant material it ingests, so toxicity, if any, will depend on which host plants are utilized by that species of butterfly. Dirty or not depend on individual's perspective. I surely do not find them dirty. No idea on how good they are as fertilizer, I suppose you can experiment and let us know the outcome. 2. 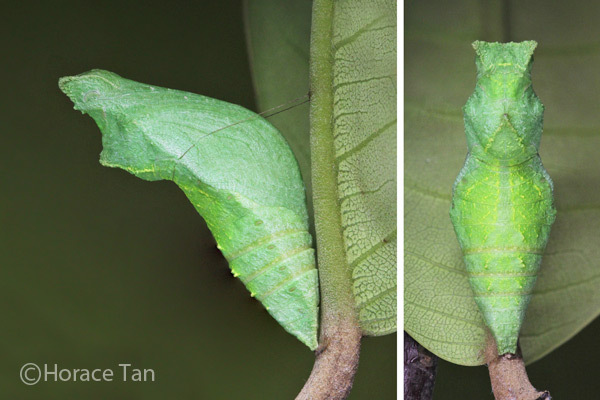 Once the pupa is deformed for any reason, it is likely that the adult, if it manages to emerge at all, will also be deformed. It does not matter whether you leave it on the ground or not. Love your blog and the detailed videos. We have reared about 9 caterpillars so far, and have also encountered our fair share of deformed butterflies (so sad). 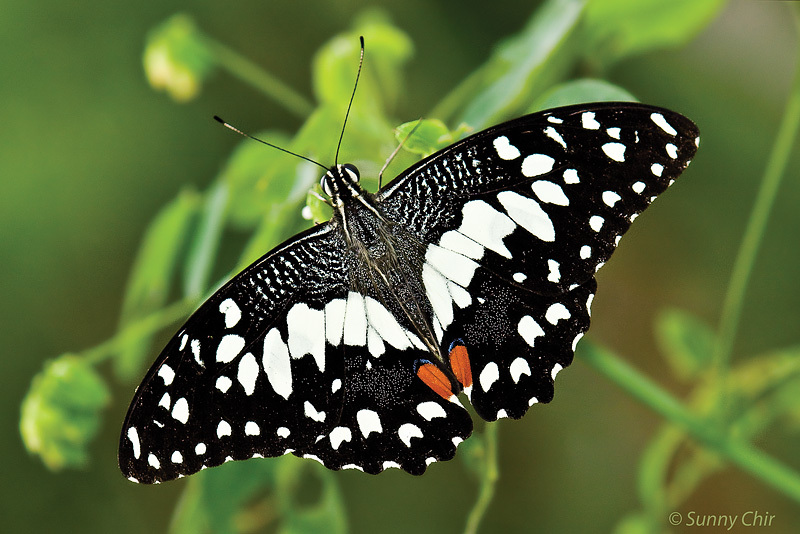 However, it is always a joy to see each new butterfly being "born" and released into the wild.